With an unprecedented amount of people attending the inauguration of President-elect Donald J. Trump, residents of Washington D.C. are finding themselves dealing with increased preparation efforts. More than 800,000 people will have to be kept safe while also being barricaded along the Inauguration Day parade route down Pennsylvania Avenue. But the barriers aren't just on that street — there are plenty along several streets surrounding Capitol Hill and in downtown Washington, and they've been there most of this week. For locals, it means more navigation and taking some extra time during their daily routine. For the 2009 and 2013 presidential inaugurations, limited-edition, commemorative Metro Smartrip passes featured photos of President Barack Obama. The 2017 pass that will be used on Friday features an American flag and the White House instead of the face of President-elect Donald Trump . The day prior to the inauguration, 50 Metrobus routes will be affected by security measures . Route changes could impact riders through Sunday, Jan. 22. Metrorail riders may also be affected as some stops will be closed for Inauguration Day. 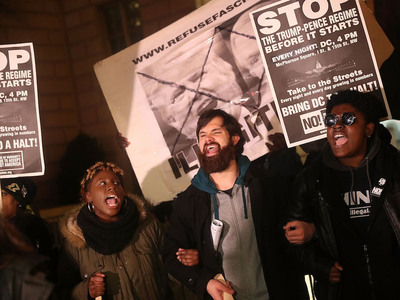 Groups of people have arrived in Washington DC throughout the week, ahead of Inauguration Day, crowding the airports, restaurants, sight-seeing spots and hotels. 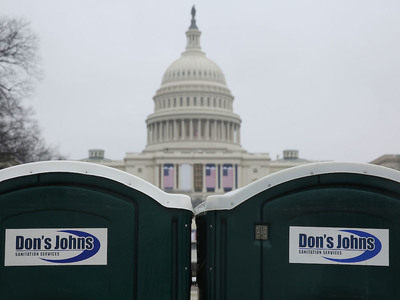 The owner of Don's Johns sanitation service is not thrilled with inauguration event planners who put blue tape over his logo on portable toilets at the sight of the inauguration. Some believe it was done because it connects Donald John Trump's name to using the toilet. But a statement from Architect of the Capitol says it was simply because the advertising is not compliant with Capitol Grounds restrictions on advertising. The owner said the company would be removing the cover tape. Those willing to rent out their Washington DC-area homes are earning a lot more than usual: One woman told ABC7 in Washington DC she rents a room in her home via Airbnb for about $100, but for the inauguration she is charging $650. Airbnb Citizen reports 13,000 have rented via the app, making Friday the largest single day in Airbnb history for the District of Columbia. Scripps Digital National Editor Mandy Gambrell is in Washington DC for the inauguration events. Follow her updates @mandygambrell on Twitter.